PANAMA CITY BEACH, FL (August 1, 2008) - Live Vows™, a leading wedding webcast provider, today announced it is now offering mobile webcasts to couples getting married in Northwest Florida. Partnering with a leading mobile broadband provider has opened the doors to webcasting from almost any location. The basic component of a Live Vows™ wedding webcast includes broadband-quality live audio and video of the wedding ceremony, streamed real-time over the Internet, to invited webcast guests throughout the world. "The Emerald Coast of Florida has become one of the top wedding destinations in the country. With thousands of weddings performed in hundreds of locations each year, our new mobile technology gives us the flexibility we've needed for a long time," said Steve Nichols of Live Vows™. "We can now webcast from the beach, a house, a resort or almost anywhere without having to worry about the technical obstacles involved with traditional Internet connectivity." Wedding webcasts are quickly gaining in popularity as more people than ever are getting married away from home. Webcasts offer an affordable and convenient way for brides and grooms to invite family and friends to "attend" their wedding virtually. 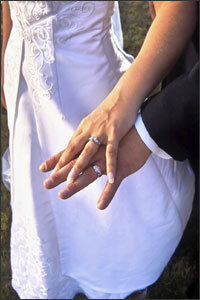 Many couples have also found wedding webcasts to be a great way to reach out to loved ones located around the globe. The new mobile technology was tested extensively throughout the Emerald Coast and performed nearly flawless at all locations. "We wanted to be sure that our mobile option was as reliable as a traditional Internet connection," said Nichols. "We were surprised at how well it performed and are excited to finally offer mobile webcasting as an option at Live Vows™." Mobile webcasting will have a huge impact on brides and grooms getting married on the beach, where Internet connectivity has been impossible or difficult in most situations. Beach weddings have become extremely popular along the Emerald Coast of Florida, due largely to the natural beauty of the area. Now, couples getting married on the beach don't have to be excluded from webcasting as an option. Live Vows™ can help brides and grooms experience the joy of allowing those not in attendance to experience the wedding as it happens. Founded in 2006, Live Vows™ is located in Panama City Beach, Florida and currently services most areas in Northwest Florida. Arrangements to provide webcast services outside of Northwest Florida can be made, and in some cases, equipment rental to videographers is possible. Live Vows™ is a division of Watch This Productions™, a company that also provides webcasting services for all types of live events through its corporate division, Webcaster Live™. Events that can be webcast include corporate meetings, conferences, medical training, sporting events and more. For more information about Live Vows™, visit: www.livevows.com. For more information about Watch This Productions™, visit: www.watchthisproductions.com.